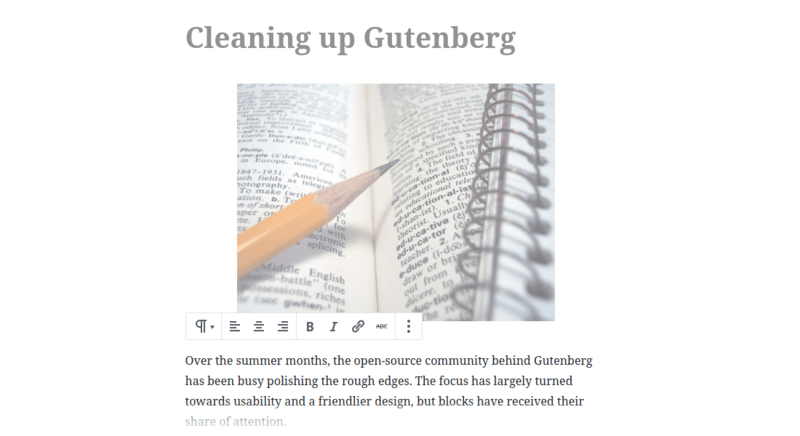 Over the summer months, the open-source community behind Gutenberg has been busy polishing the rough edges. The focus has largely turned towards usability and a friendlier design, but blocks have received their share of attention. 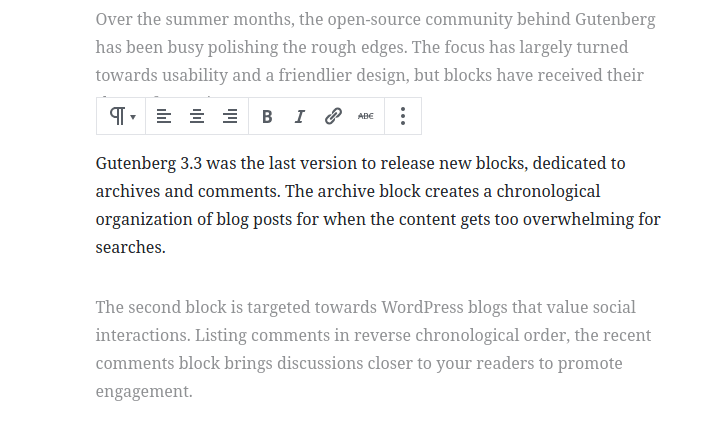 Gutenberg 3.3 was the last version to release new blocks - one is dedicated to archives, and the other to comments. The archive block creates a chronological organization of blog posts for when the content gets too overwhelming for searches. The second block is targeted towards WordPress blogs that value social interactions. Listing comments in reverse chronological order, the recent comments block brings discussions closer to your readers to promote engagement. The ensuing updates gave small boosts to multimedia. 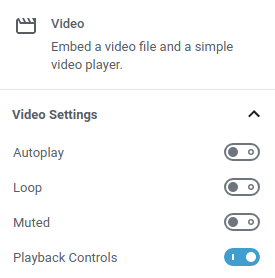 Videos now come with new playback controls to define their behavior; they can be made to play automatically or on a loop, or be muted altogether. Playback controls, such as volume and pausing, are available to users by default, but they can be hidden completely. Videos are not the only multimedia that has gained traction. Audio files are the voices of podcasters and artists around the world. As from the latest version, audio files can be embedded in Gutenberg by drag-and-dropping them alongside your content. Shared blocks have been on the receiving end of constant updates, including in version 3.9. First and foremost, they been renamed to reflect more accurately their purpose - reusable blocks. Described as templating support, reusable blocks can now be made up of multiple components - in other words, the general structure of an article can be saved and reused. Owing to slew of new features, Gutenberg has introduced a new page to manage reusable blocks, which is accessible when adding a ready-made block. Moreover, with the new exporting and importing tools, you can take your templates wherever you blog! Gutenberg’s usability updates have touched every area of the editor. When editing blog posts, WordPress lets you choose which editor to use. As expected switching across editors does not guarantee portability of content, which is why Gutenberg now shows a warning to alert the unsuspecting blogger. Embedded blocks can also now be edited without having to recreate them from scratch by using a new, handy edit button. But the highlights of the usability changes are without a doubt the more recent additions to the plugin. Proficient users will know the editor like the back of their hand, but there is only so much that knowledge can do to help speed up content creation. Gutenberg 3.6 has added keyboard shortcuts as a new way to navigate content swiftly. Now, you can insert, duplicate, inspect or remove blocks with the stroke of a button. Moreover, Gutenberg has been made friendlier for writers. Clutter is very often a hindrance. Maybe you are writing a detailed feature article, or distractions simply abound. Gutenberg’s spotlight mode takes away some of the problem. Presented as an optional setting, this mode fades away all the blocks that are not being edited to bring the block that deserves your attention to the forefront. Spotlight mode can be enabled from the editor’s top-right menu. Just below the option is another introduction from Gutenberg 3.8 - fullscreen mode. Fullscreen mode hides even more needless clutter from your view so that you can focus on the content. Best of all, the two modes can be combined together for a clean, minimal interface. The devil is very often in the details, and it is a maxim that goes beyond behavior. Gutenberg’s style has changed subtly to make it easier to distinguish between editable fields and static content, or to differentiate buttons from other elements. Most visible in the design updates are the new block icons. Prompted by the long list of new blocks that are being added to Gutenberg by third parties, blocks are now encouraged to use material design icons. This adoption should make it easier to distinguish components, apart from affording generous white space to icons. WordPress 5.0 is right around the corner, and for Gutenberg the time for novelty has passed. The recent updates bring the new editor in line with content creators’ expectations in preparation for its take-over. If you want to get used to the new editor before it hits blogs, there is no better time than the present!